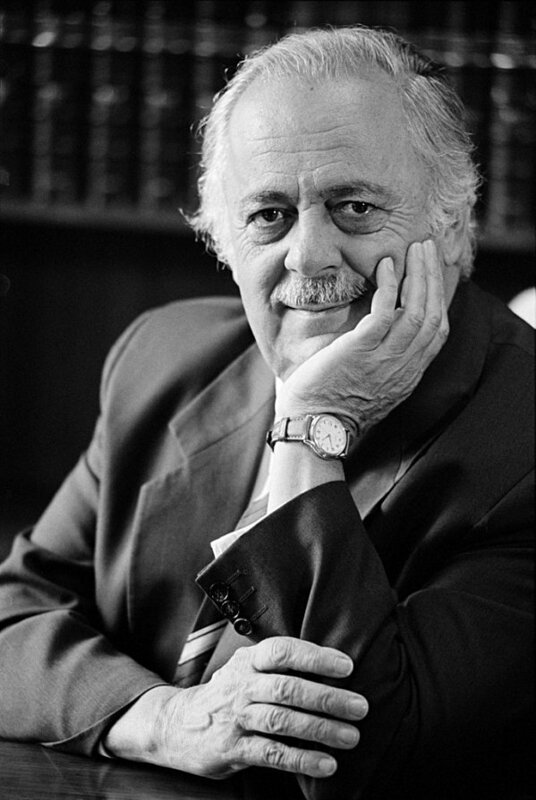 George Bizos was born in 1928 in Kirani, Greece. In 1941 he arrived in South Africa as a World War II refugee together with his father. He was then thirteen years old. They first place to arrive at was Durban and later moved to Johannesburg where their entry was made simple and smooth by the presence of other Greek community members. While in Johannesburg he enrolled for a law degree with the University of Witwatersrand. In 1950 he completed his law degree at the University of Witwatersrand. In 1954 he was admitted to the Johannesburg Bar. He served as an Advocate in Johannesburg until 1990 when he worked as a counsel to 40 lawyers at the Legal Resources Centre and the Constitutional Litigation Unit. During the Apartheid years Bizos dedicated his working life to fight for the basic Human Rights. After the collapse of the Apartheid he turned his fight into ensuring that all South Africans equally enjoy those rights enshrined and guaranteed by the constitution. In his legal career he represented lot of political activists in high profile political trials. He represented Walter Sisulu and Nelson Mandela in both Treason and Rivonia Trial. Apart from Mandela he appeared in the Truth and Reconciliation Commission representing families of killed heroes of our liberation struggle. He represented the families of Steve Bantu Biko, Chris Hani and the Cradock Four (Matthew Goniwe, Fort Calata, Sparrow Mkhonto and Sicelo Mhlawuli). In the TRC he blocked amnesty applications made by the perpetrators of these murders. In 1989 he published a book called No one to blame? In pursuit of Justice in South Africa. In 2004 Bizos represented Morgan Tsvangirai, president of the main opposition party (Movement for Democratic Change) in Zimbabwe who was charged of high Treason by Zimbabwean government. When Bizos is not in courtroom he would spend his time in vegetable gardens. Bizos received quite number of awards for the splendid job he performed during his legal career. He also occupied high positions in different institutions. On 25 October 2004 he received the International Bar Association's (IBA) prestigious Bernard Simons Memorial Award at Auckland. On 3 November 2004 he received annual Sydney and Felicia Kentridge Award, from the General Council of the Bar. He is currently living in Johannesburg and married with three sons. Other Achievements and Positions held by Bizos. 1979 - 1993 - acted as defence counsel in numerous high profile political trials, founding member of the National Council of Lawyers for Human Rights. 1982 - 1994 - Senior Counsel at the Legal Resources Centre in Johannesburg in the Constitutional Unit; member of the Board of Trustees of the Centre for Applied Legal Studies at the University of Witwatersrand. 1990 - 1994 - Member of the ANC's Legal and Constitutional Committee.